If the word "EzineArticles" falls out of your mouth when you start talking about your SEO, you should just stop right there. Even before the Panda update, this really wasn't the best use of your time and essentially was just a way to get some quick links back to your site. I have one last bone to pick with something that a lot of people don't think of when it comes to SEO, but it fits and I'm tired of running into it. You know that website that you have? Oh, you helped design it? Yes, I see how that menu looks all cool. Flash, you don't say? The next time you go to build a site, hire a designer. Shop around. But when you find one that's good, trust in them and their design work. They do this for a living and you don't. Guide your designer, but don't do the designing. You didn't hire them to just use tools you don't understand. Allow them the freedom to make something great for you. 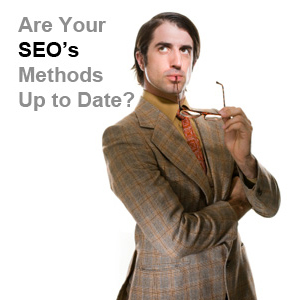 At the same time, you should also hire a great SEO. This person will work with the designer and the developer to ensure that what you end up with not only works to your needs but will do everything it needs to do in regards to the search engines as well.